Yes, a new venue and a new date. We have brought the AGM meeting forward into October to suit those who dislike the dark evenings that come with the reversion to GMT. We have also found a new venue - the West Oxford Community Association, henceforth WOCA. Regrettably WOCA's cafe no longer opens on Saturdays so it's a “bring a butty” lunch as usual. We will have access to hot water for making tea and coffee. The meeting will run 10am to 3pm as before. The detailed schedule will be announced nearer the date. Here's the WOCA web site http://www.woca.org.uk/ which includes a map. 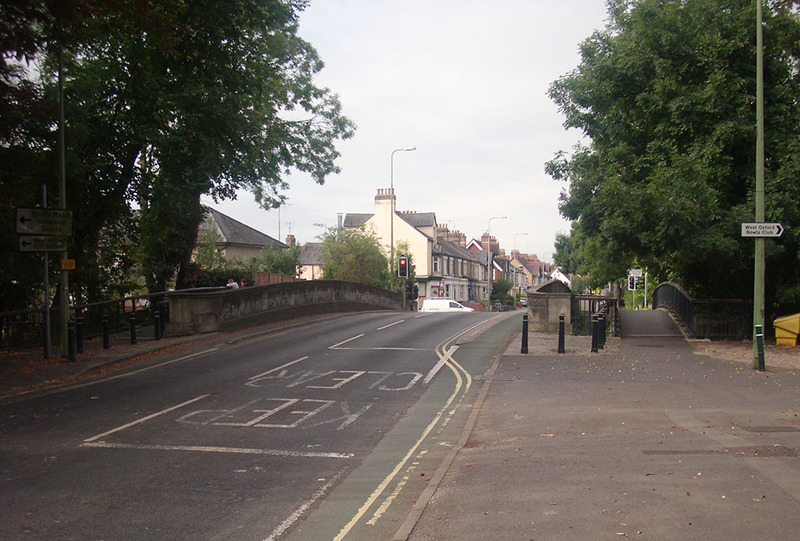 Unless you know Oxford, I suggest you approach the City Centre from the WEST using the A420 in from the A34. After some distance, you will reach a T-junction controlled by traffic lights. There is a major turn to the right which you don't want. To make space for the right turn lane the forward traffic lane makes a conspicuous swing left and back. The road then climbs a bridge over the river. You need to turn left immediately after the bridge. This picture is taken from just past the WOCA entrance, the entrance is covered by Keep Clear markings as you descend off the bridge. Alternatively, you could catch the 400 bus from either the western “Seacourt” or eastern “Thornhill” Park&Ride sites. There is a stop (“Osney Island”) immediately outside & opposite WOCA. Buses that stop there are: 4, 11, 44, 63, 66, 400, S1, U1, X30. The 400 bus is the east-west Park&Ride service so this could be used from the western “Seacourt” car park or from the eastern “Thornhill” car park. If coming from London on the X90 or Oxford Tube services and you have, like me, a 'wrinkly' free bus pass, you could save even a short walk by switching to the 400 bus at either Thornhill or in town at Queen's Lane. The X90 and Oxford Tube terminate at Gloucester Green which isn't served by the 400 P&R bus. It's really not worth catching a bus from the station. If you arrive on platform 2, and the disabled gate is open, you might be able to get out on that side and save a couple of hundred yards. Essentially leave the station, turn right long the Botley Road until you reach the bridge in the picture above (you'll cross another bridge before you get there).